Hitman is Microgaming’s feature-rich online video slot based on the assassin theme. Players can win up to 270,000 coins playing this slot. To play Hitman slot, players need to place a bet and hit the Spin button. Players will win prizes according to the winning combinations displayed on the screen at the end of one spin. The slot has 15 paylines and players can bet up to 20 coins per active payline. Since the coin values range from $0.01 to $1.00, players can bet up to $300.00 per spin of the reels. Hitman is based on the deadly assassin theme. In keeping with its theme, it has smooth animations, splendid graphics, and entertaining audio effects. The slot is ideal for players who like plenty of action, thrills, and adventure. The reels feature icons of snipers, attaché cases, loaded guns, cash, sliver ballers, sniper rifles, knife, poison, and fiber wire. The slot challenges players to assume the roles of assassins, shoot at targets, and win big prizes. The Agent 47 symbol serves as the wild, substituting for all other symbols and helping players complete winning combinations. However, it appears only on the second, third, and fourth reels and expands all over them. Players should also note that they cannot use the Agent 47 symbol to unlock the bonus features or the free spins bonus round. 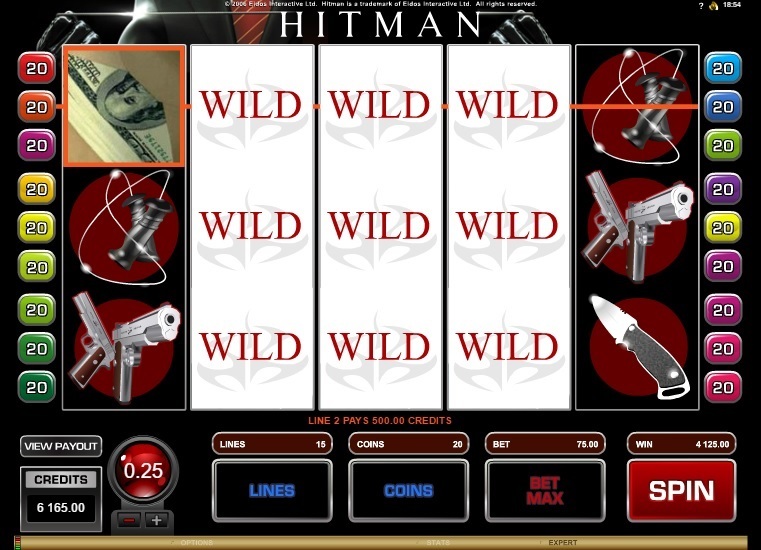 Hitman slot has three scatter symbols—the Mini PC, the Insignia, and the Number 18 symbols. The Insignia symbols appear only on the first, second, and third reels. If players get at least three Insignia symbols anywhere on the first, second, and third reels, the Insignia Bonus Game gets activated. The Mini PC icons appear only on the third, fourth, or fifth reels and help trigger the Contract Bonus Feature. The Number 18 symbols appear scattered all over the reels. If players get at least 3 Number 18 symbols anywhere on the reels, the free spins round gets activated and players will get 18 free spins with doubled wins. During the free spins round, the wild symbol turns into the expanding wild, helping players win bigger payouts. When players activate the Insignia Bonus Feature, they will be prompted to select one of the Insignia symbols on the reels to get a bonus prize, which will be credited to their accounts after being multiplied by the number of active paylines and the bet per line. The Contract Bonus Feature prompts players to select a weapon and a target to win a bonus cash prize and a multiplier value. The size of the bonus cash prize depends on the target that players succeed in hitting. Players can win up to 45,000 coins in this feature. Hitman is available for fun or real money at any Microgaming online casino.